Mount Sopris (12,965 feet) is located in the White River National Forest and Maroon Bells-Snowmass Wilderness Area near Carbondale, Colorado. 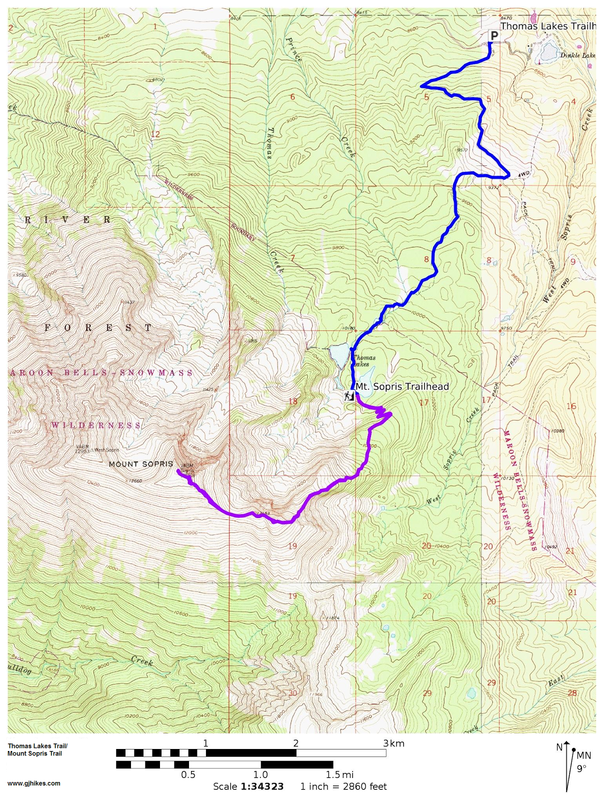 The trail to the summit can be completed as a very long day hike beginning at the Thomas Lakes trailhead on Dinkle Lake Road or by splitting it up over several days by first backpacking into Thomas Lakes on the first day and then hiking Mount Sopris the next. It can be difficult to complete the hike in one day during the times of the year when afternoon thunderstorms are most common and be back below treeline before the lightning starts up. In order to do so you should plan on leaving from the trailhead very early in the morning. To get to the trailhead follow the directions for the Thomas Lakes trail. 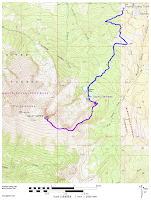 The Mount Sopris trail begins at the end of the Thomas Lakes trail. 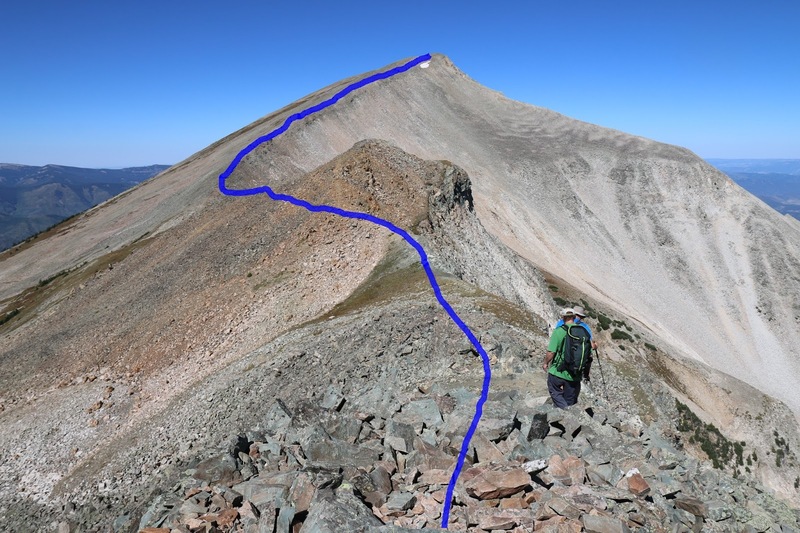 The route to the summit of Mount Sopris begins climbing immediately at a moderate pace. As the trail progresses several switchbacks help to maintain the moderate climb. The trail gets much steeper as it leaves the shelter of the forest and heads on up the mountain. The difficulty increase considerably once the trail reaches the ridgeline. Much of the ridge is covered with a thick layer of talus that tends to move under your feet. 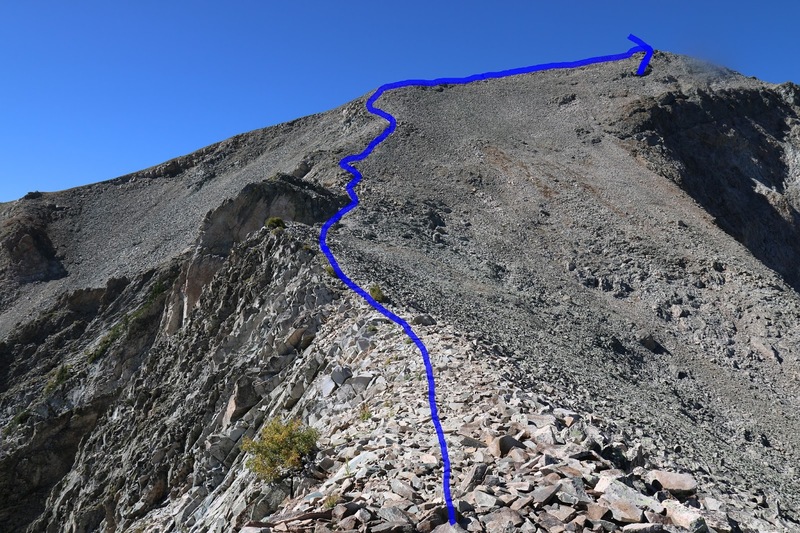 Due to the constant shifting of rocks it is hard to cairn a route through talus like this. For the most part try not to get to far off to the right away from the ridgeline. The crown of the ridge is the most direct route and it tends to be a little more stable. Once you get up the first section of loose talus the route gets easier for about a hundred yards or so before it encounters another longer stretch of the same type of trail. Since talus is chunks of rock that have broken off and are slowly succumbing to the forces of gravity the highest points of the ridge tend to have a thinner layer of it. After the trail makes it up the first ridge it bends to the right and starts up another ridgeline. At this point the trail has reached above the 12,100 foot level. As the trail continues climbing it reaches a false summit that is about 12,380 feet. (I say about because the altimeters on the GPS devices work off of barometric pressure and require frequent calibration to be very accurate.) From the false summit you can see most of the remaining trail. From here the trail loses about a 100 foot of elevation before it begins ascending the final assault to the summit. For the final assault there is less talus if you stay to the right side of the mountain near the edge of the ridge. There are all sorts of trails that you could follow and fortunately as long as they are going up they all lead to the summit. There is actually another false summit at the top of the last ridge but it is an easy traverse to the actual summit so it isn't any big deal. The summit itself is a big rounded know that just happens to be the highest point of the ridge. Previous adventurers have built a number of short rock walls to take refuge behind if you happen to make the trip on a windy day. And speaking of summits, Mount Sopris actually has two of them that are both the same elevation. If you want you can hike down the saddle between them and claim the other one while you are at it. Looking southward over the Elk Range the prominent mass of Capitol Peak (14,130) will grab your attention. Snowmass Mountain (14,092) is about 2.5 miles to the right of Capitol Peak. 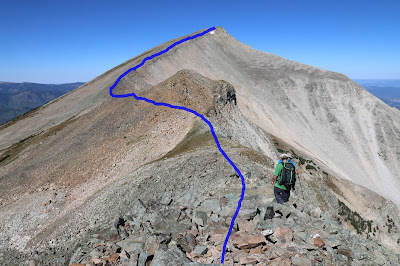 When you look up at Mount Sopris from the lower elevations it looks nice and smooth but once you get on the summit you can see just how rugged it really is. This picture can be very thought provoking. Looking down the collier on the eastside of the mountain it looks like a snowslide or a mud flow but it is all talus. You can see how it sluffs off the ridges and pushes its way lower like a slow moving avalanche or glacier. Because of the amount of effort it takes to climb it Mount Sopris gets compared a lot to climbing a 14er. The fact is there are at least a handful of 14ers that are much easier to climb. The biggest difference between Mount Sopris and a 14er is the percent of oxygen. It is only about a 4% difference but it is still very noticeable. Be careful on the trip down the talus. It tends to move more when you are going downhill. If you knock any rocks loose be sure to yell 'ROCK' as loud as you can if there are people below you. Best practice it to wait until the way is clear below you before hiking down the loose areas. Mount Sopris is definitely a summit that you can get a big feeling of accomplishment from bagging. If you would like to see it for yourself then all you have to do is 'Take a hike'.